JAKARTA, Indonesia (CNN) -- Indonesia is no stranger to bombings such as the one that rocked two luxury hotels in Jakarta on Friday. 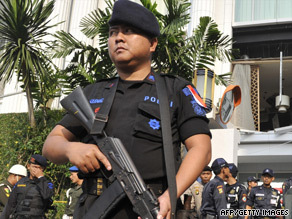 Indonesian counter-terrorist police commandos secure the damaged Ritz-Carlton hotel in Jakarta. As authorities sift through the rubble of the JW Marriott and Ritz-Carlton hotels, which were struck by bombs that killed at least eight people, some could not help but think about past bombings in the Southeast Asian country. In 2002, a bombing at two night clubs on the island of Bali killed 202 people, mostly foreign tourists. More than 300 people -- many of them young Australians on vacation -- were wounded by the massive blasts in the town of Kuta. Dozens of victims were burned beyond recognition or blown to pieces. The bombing was blamed on Jemaah Islamiyah -- a terror group with ties to Osama bin Laden's al Qaeda terrorist network. The group is suspected in other bombings. Many of those convicted in the plot were sentenced to death or life in prison. In August 2003, the same JW Marriott Hotel that was attacked Friday was bombed, killing 12. The Australian Embassy in Jakarta was targeted in 2004. A powerful car bomb shook Jakarta's central business district, blowing a hole through the embassy's security gate, killing at least eight people and wounding about 168. A year later, three suicide bombers targeted two tourist spots on the resort island of Bali. The bombings -- two at the cafes near Jimbaran Beach and one at a restaurant in Kuta's main square -- killed 19 people and wounded at least 132, according to hospital officials. "In recent years, we have several preventative successes in arresting terrorist cells just before they were able to make their attacks. And we have not had an attack since the Bali bombing several years ago. But this is a blow. This is a blow to us. But we will find out the perpetrators."